Venue: Borealis Auditorium, Lapland University of Applied Sciences. Rovaniemi, Finland. 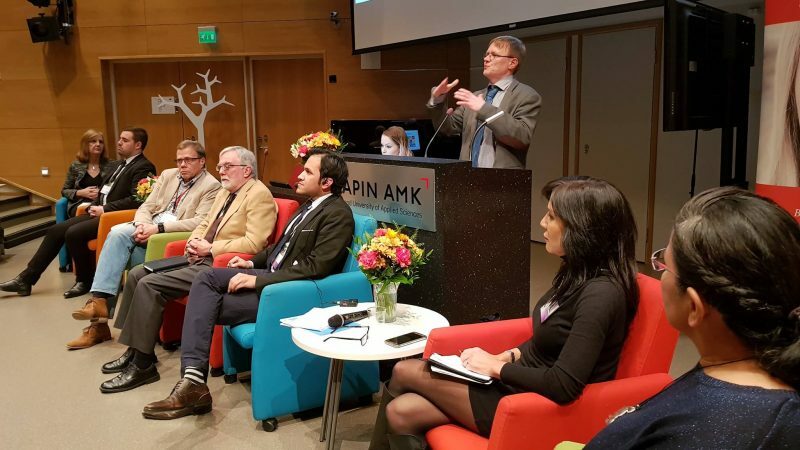 SDGS AND THE ARCTIC: WHERE DO WE GO FROM HERE? Dwayne Menezes: Sustainable Development Goals is an area we have liaised with the UN about previously. It was a great opportunity for us to connect these in the Arctic context to discuss how they – all 17 of them – are relevant and think about where do we go from here. We have identified in the discussions we have had over the last year, but especially the discussions we have had [at the Arctic Spirit Conference] over the last two days, there is something very relevant about the SDGs in the Arctic context. The questions remain: What do we do with this knowledge? Where do we go from here? How do we measure what is going to happen? How do we make sure this priority of the Finnish chairmanship moves forward in the next two years and makes substantial progress by 2030. On that note, I would like to thank the organisers on behalf of Polar Research and Policy Initiative (PRPI), as well as Lapland University of Applied Sciences (Lapland UAS). I would also like to thank the University of Saskatchewan Johnson Shoyama Graduate School of Public Policy that has supported this event, as well as Trent University, with Heather [Nicol] representing that institution. 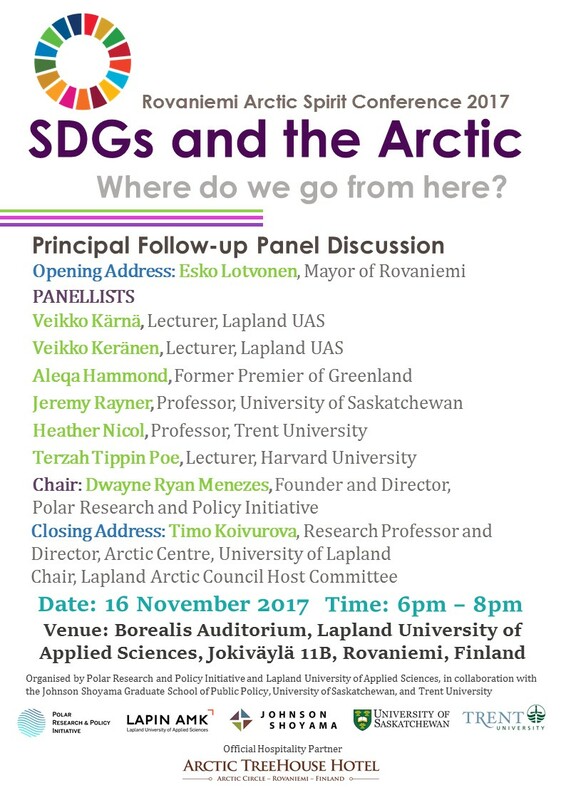 On that note, I am going to start introducing our panellists: Veikko Kärnä, Lecturer, Lapland UAS; Veikko Keränen, Lecturer, Lapland UAS; Aleqa Hammond, former Premier of Greenland; Jeremy Rayner, Professor, University of Saskatchewan; Heather Nicol, Professor, Trent University; Terzah Tippin Poe, Lecturer, Harvard University; Mikaa Mered, Lecturer, Institut d’Etude des Relations Internationales (School of International Relations); and, of course, Esko Lotvonen, Mayor of Rovaniemi, who kindly offered the welcome address. Let us now commence the panel discussion. What are the SDGs that you have found most relevant to the Arctic, or what are the SDGs you feel most passionately about, preferably one or two SDGs? Aleqa Hammond: I think it is very difficult to point out one. They are interconnected. If I had one favourite, it would be sustainable cities and communities. It is because communities are the centres of society. If communities are sustainable, everything else falls along. Terzah Tippin Poe: I agree with Aleqa. I think they are all important. Going back to the opening remarks, which I thought were very relevant, he mentioned the theme of the conference. The theme is doing work together. That is incredibly important and points to SDG 17. I do not think we can make progress on any one of these goals unless we have partnerships that are collaborative with communities and Indigenous peoples. Collaborating with Indigenous peoples is very important to me, along with what we can learn from them. I am advocating for number 17 because I think it is an umbrella to make the rest of the goals actionable. (Editor’s note: Goal 17 calls for partnerships to fulfill the goals). Jeremy Rayner: It is a pleasure to be here. For me, energy is important. Also, a theme of the conference over the last two days that has been very important and mentioned by other panellists is the interrelationship between the goals. It is the sense that we might find groups of goals. It is the sense that they are all related to each other. For me, energy and climate change are key. How we tackle the relationships between energy and climate change has an important impact on food security, water security and life on land. Veikko Kärnä: First, I vote for number 9, namely industry and innovation. The reason is that I have been reading these things all my life, in academia and my previous life as a business executive. Second, I am for partnerships. I think that this meeting today is one sign of the partnerships that can be built from these events. Mikaa Mered: I will vote for number 15 – life on land. I come from a country where people refer to the Arctic as an ocean. They always leave out the life on land, whether it is fauna or human. We need to educate people in the south that what happens in the Arctic does not stay in the Arctic. What happens in the Arctic does not happen only on the water, but also on the land. Heather Nicol: I was going to say education and infrastructure, but the other comments made me realise that I am going to vote for number 1, on poverty. Arctic-8 countries are not poor countries, but there are great inequalities. If we get number 1 and we understand the differences between traditional economies, as well as what might be poverty, that relationship is really fundamental. Veikko Keränen: I will present something we have been doing here. I also think there are some items on which we could develop collaboration. My background comes from mathematics and physics. It is related, but bear with me for a while; it will be connected to the theme. You can see the Arctic area. If you think about the Northern lights, or polar lights, that zone is quite small. It covers a small area of the earth. Of course, people are not living on the Southern pole. That is one of our strengths. People love to come to the Arctic. I will be speaking about some opportunities, and maybe some worries. Finland’s 100th anniversary of independence is the 6th of December. In a few weeks, there will be a satellite sent into space to celebrate this event. Nowadays, there are good cameras in them. You can see the Northern lights from space. You can do all kinds of interesting measurements. This could be an opportunity to collaborate in the Arctic. If the satellites go around the Northern pole, you can see the whole area. A Lapland satellite is being planned right now, with other universities. It is planned to be put into space in the year 2020. On a totally different topic, this connects to production. It comes from our research. Here are the participating students. The field is computer science. We work to find a solution to a famous problem that was open for 30 years. After many complications, we found a solution. What you see here is an infinite string without any evidence graphs, avoiding certain boundaries. It is very rare. It took 17 years and lots of hard work to find an example. If you think beforehand of what you will find, or if you have an idea, you know it is full of surprises. After a lot of hard work, there will be a lot of counterintuitive things discovered. This one has been applied in cryptography, security engineering and emergency management. It is very interesting in bio-info metrics. The string that we saw is relevant in DNA and RNA. It avoids repetitions, which is why it has been used. In school, we learn DNA forms a double helix. But, if there are repetitions, it will twist to itself. There are many diseases that are known to happen because of this. In gene info-metrics, it is a meaningful thing. Some strange things will happen that you cannot anticipate. This was taken two years ago at Finland’s Independence Day. This is the first photo I took. It is 8 seconds, with many observations. It is 5 seconds. Even if I knew it was coming, I would not have been able to predict it. You can see steam is coming out of the rock and the ice inside. We do not understand the structure. There is no systematic way to produce it. It is hard to get. The thing is, it is so fragile. The structure is very counter-intuitive, which is the most important thing. Because it has that feature, it is like block-chain technology, which is foundational technology for currencies, which is very heavily used. There are lots of bits of money. Bitcoin is the most famous example. Going back to the string, if you change one bit, it will be detected. Maybe it will be possible to change it so it will be scientifically meaningful. Now, it is basically meaningless. If we are thinking 10 years down the line, and artificial intelligence exists at a high level, it will have a huge impact on society. We know the line is much longer than that. After every 5 years, you get 10-fold computational power for the same money. After 100 years, it is 10 to the power of 20. On education, we organised star days for students and even kindergarteners. It is about our nearest star, the sun. If you look at the zone between the moon and the sun, it is a huge place. The Northern lights are just a sign of its activity. It is like we are swimming in that ocean and trying not to hit this disturbance. This is what happens. That can be really something globally. Maybe we can discuss this later. We did an isolation experience in Rovaniemi. It was the first one in the world. We tried to test what happens if we disconnected totally from the network. We need to do that to know what to do to be prepared. We should be prepared for the worst, but there are always good things that happen. Dwayne Menezes: Can I ask each panelist, can you share your observations about the discussions over the last two days at the conference? What are you taking home that is valuable? Can I ask Heather to begin? Heather Nicol: It was, for me, a very interesting discussion. I will tell you one or two things. First of all, what fascinates me is the relationship between resilience and sustainable development. They are not one and the same thing. I was interested to see how they are very intimately related. I was interested to see how people are working through those relationships, such as whether the concept of resilience was used to provide information that might then be measured. This information might then feed back into discussions about sustainable development. I was interested to see whether, in some cases, people were talking about resilience as an outcome of sustainable development. Resilience is a different model of how socioeconomic and biophysical systems are related, with the social embedded in the biophysical, basically. I think this is a really interesting relationship that we talk about. Second, the other thing that was striking and that I had not heard before was at the Indigenous people and the media session. It was the talk about information and the control of information as critical for development, resilience and knowledge about the North. I thought that was really brilliant. Media, in the end, are the gatekeepers. Mikaa Mered: I see some of the students who organised the Arctic youth forum on Monday. I want to congratulate them. Thanks to their commitment to this event, we have been able to place the topic of youth in many different panels. That is something that is very important. We tend to go to conferences about the Arctic where the youth are not a topic. When we talk about the youth, we tend to have youth come from outside the Arctic who are thinking about innovations. Where are the local people? That is something I ask myself. Here, that did not happen. It was very local. The way we took it through different panels was very refreshing. We tackled all 17 SDGs, because they care about these things, and they have great ideas. Veikko Kärnä: Education is a very important issue. The development of the Arctic region should be based on knowledge. That issue was discussed in many speeches. At our university, we are trying to give competence-based education to our students. That is quite important. I would like to stress the importance of academia in the further development of the North. Jeremy Rayner: It is hard as an academic not to stress the importance of academia. I will try to go somewhere else. It was wonderful to have a conference here, in this beautiful city. It reminds us people who come from other parts of the world about the diversity in the Arctic. We often tend to stress the Arctic as a region that shares similar issues and problems. To be in a city that is on the other side of the Arctic Circle, it challenges us who tend to think of the Arctic as sparsely populated and lacking infrastructure. That was a very important reminder. The other thing that will stay in my mind and relates to the SDGs is the closing comment from the President of the Saami Parliament. It was the fact that the health and wellbeing of the people of the Arctic depends on the land. We need to balance and think of it as an integrated whole. That is something that the Sustainable Development Goals strive towards. The challenge is to achieve a balance. Terzah Tippin Poe: I would like to point that we have a great panel here, surrounded by people from around the Arctic. I am from the US Arctic. My home village is Barrow, Alaska, which is the farthest northern city in the US. We have about 5,000 residents. I, too, am impressed with coming together of the people of the Arctic. Often, when you grow up in the Arctic, it feels isolated. Yet, you come to a place like Rovaniemi in Finland, and you realise that we have so much in common. We are solving the same problems in unique ways that we can share and collaborate around. This is really important. The Arctic is a model for the rest of the world’s sustainable development. My people have been doing business in the Arctic for 14,000 years, and they are still here. I think that has lessons for us as modern peoples in the Arctic. There is a whole concept of the outside and the global community that have discovered the Arctic. Well, we have been here a while. It is gaining a global prominence. They come and say that they have innovations and things to teach that will save the Arctic. In fact, it is just the reverse. We have developed and adapted over hundreds of thousands of years. The 4 million of us who live in the Arctic have a model the rest of the world should pay attention to. I want to add another quote that was impactful: In the Arctic, for the Arctic, by the Arctic. I think we have an advertising campaign in that one. The Arctic is an example of international cooperation. We are proving that today. Aleqa Hammond: Approximately 3 and a half years ago, I invited the Secretary-General of the United Nations to my homeland, and he came. I brought him out with local hunters on dogsleds. He was very moved and fascinated by what he saw. He saw how the hunters were thinking and living. He came back and developed 17 SDGs for the rest of the world. I believe these 17 SDGs are a reflection of the Inuit lifestyle. We recognise them all in our way of understanding the sustainability of the world. That is how we survived in one of the harshest regions in the world. That means that the world has never been as interconnected as right now. Best practices are being put in writing by the United Nations. When I see the discussions, I notice that everyone agrees about the SDGs. Everyone agrees about what has to happen in the Arctic. What is missing is that the Arctic is not one thing. It is many things. The Arctic is the Arctic 5, the 8 states of the Arctic Council, different languages, different continents and different economies. When dealing with the SDGs, we are going to have to deal with different funding, policies, priorities and achievements from one place to the other. In our own Arctic regions, what can we do to pull the others along? How can we help the others along? Sustainability is not one word. It is economic, cultural, financial, political and so many things. The next step should be to redefine our own terms of sustainability in the Arctic if we want to achieve any of the 17 goals. Veikko Keränen: It has been a very exciting two days. I think what I take away is that we are a model for the whole world. I agree with that. We have a good starting point. My friends from the South envy us who live in the North. They are not against us. It is the other way around. Dwayne Menezes: I think what we learned is that the SDGs are a popular and fashionable, but also a genuinely useful, term. They have the power to bring together all of these different issues, from food, water and energy security, to housing, climate and sanitation under one umbrella. It has the potential to be very useful. It also has the potential to die a natural death as a fashionable buzzword that sounds good but does not do very much in practice. If we care about the goals, we need to recognise the reality we are dealing with. It is wonderful on a theoretical level. How do we put them in practice? Where do we go from here. That means asking questions where the answers might not all be nice. But, the questions are important. So, now we will discuss, where do we go from here? How do we make these a reality? My question for the panelists is, what do you think is missing from ongoing dialogue on sustainable development? What is the missing piece? What are the reasons we might hit a roadblock two years from now while we were celebrating the adoption of the term? When we are talking about partnerships, it requires the world stage to hear us, respect us and work in partnerships, so we can all feel ownership of the new SDGs. It requires the world outside the Arctic to think with the Arctic. Anything else will fail. We have something to give other countries to learn from, and they have something to give us that we can learn from. When people talk of the Arctic, they talk of it as somewhere very far. We are closer than people think. Today, everything is very close. We can talk with people in Greenland over the phone and internet anytime we want. The Arctic is very close to the international arena. There is no excuse not to involve us. Terzah Tippin Poe: I am in agreement. The absence of Indigenous input and voices at the panels is often glaring. There were some highlights from the Saami people and great input today from reindeer herders in the regulatory process. I am very sensitive, and I teach this, on how we use pronouns. When you say “them” and “those”, it creates an other. They are different, and not part of it. Where do we go from here? Your comment on signing agreements is so applicable. I was in Paris for COP 21. There were people missing from that room. It was great that it was signed and came into being. It is a great first step. It was obvious to me who was not in that room. They were protesting outside the room in the blue zone. It was Indigenous people. Extractive industry was invisible. I would say the same is true today. We need to start solving that. Indigenous people who have lived in the Arctic for thousands of years should have a voice in these discussions. They should not be referred to in the third person. Another thing that was missing is inspired by my past work for Royal Dutch Shell. I did the evaluation for its Greenland project. I did the US country entry. It was a $7-billion project. These are massive projects. We had some industry representation sprinkled in. The size of the project for energy and mineral development by Shell and other companies has the ability to change the entire ecosystem and society for the Arctic. The fact that we do not have them in the room hearing us is an oversight and dangerous. I felt that way in Paris. I was part of a very large oil and gas development plan. We are talking about 30 billion barrels of oil in the Chukchi Sea, between the US and Russia. It was going to change the entire US Arctic. Had that proceeded as planned, we would have social, economic and environmental impacts never seen before in the Arctic. We need to get industry into the room. We need to understand what they are thinking. They need to know what we are thinking. If not, we are going to have unsolvable conflicts that would be unfortunate for everyone in the region. Dwayne Menezes: The government of Finland’s implantation plan for Agenda 2030 has, as one of its key principles, ownership and participation. Finland outlines this multi-stakeholder approach that gets everyone into the room to participate and deliver in the projects. Industry and Indigenous perspectives must be taken into account. We should reflect what we want to see in panels going forward, and include industry representatives. Jeremy Rayner: This has been a very interesting couple of days. When I look at the 17 goals, the first question that comes to mind is: Is it going to be possible to achieve them by 2030? The answer is probably not. We need to prioritise. We need to decide the priorities in different parts of the world without completely ignoring the other ones. Today, there was recognition of the importance of this prioritising exercise. As a student of politics and policy, I always think of institutions when I think about prioritising. Yes, it is important that institutions are created so that they listen and bring the widest possible diversity of voices. They must recognise the claims of the different citizens of the territories. In the end, there has to be authoritative decision-making around these priorities. In the Arctic, I do not see the capacity to do that. It is very difficult in a region like the Arctic with a number of different countries where, on a topic like energy, outside of nuclear energy, there is very weak coordination. It is hard to imagine how a priority-setting exercise can be both participatory and authoritative in a way that allows us to move forward to achieve something. Veikko Kärnä: I think there are four important actors who should be participating in discussions about our future. It is academia, industry, the public sector and local people. Those four actors are the main ones who should participate in the discussion. I agree that industry people are missing from this conference. All those four actors could form an innovation system for each region. There are regions that are a little bit ahead of other regions, and regions that are a little bit behind. In each region, these four groups should participate. As a member of the Lapland University of Applied Sciences, I would like to stress the importance of students participating in the creation of the future. We need entrepreneurs. We, in academia, are the ones who can be part of creating those entrepreneurs for the future. When we have entrepreneurs, we will have new business and innovation. Mikaa Mered: We need money. We lack money from governments and the private sector. Where are the hedge funds and investors? We also need inclusiveness regarding three things. First, we need representatives from industry that are missing, like those I mentioned. I also want to mention insurance companies. Without them, nothing will happen in the Arctic. No matter what you want to do, whether it is private or public, you need insurance. The second is energy. Energy is important, but energy companies do not want to come. I understand them. Before they are in the room, there is finger pointing and shaming. They do not want to show up because they do not want that. The third is territory. France is sub-Arctic. We have boreal forest. We have the same challenges as many other territories. Yet, we are not part of the Arctic. We are not part of discussions when we face many of the same challenges. We also need the youth. Are they allowed to discuss what they think? We did that on Monday, but usually we do not. If we go to consultations on energy in Greenland and Alaska, where are the youth? Dwayne Menezes: One of the great compliments for the conference is that it did bring together different stakeholders. There was a panel on media, youth and SDGs. Heather Nicol: One thing I noticed is how different the issue of gender looks in the Arctic versus the sub-Arctic. I was really privileged to have a colleague come into my class to talk about reconciliation in Canada. Two hours later, we were still talking about gender, because gender relationships in different parts of the North are not necessarily equal. When we think about sustainable development, we think about it as a problem of the global south. It is the advertisements of hungry children and women in countries at war. There is a really difficult situation in parts of the circumpolar North that is very invisible. In Canada, there was some work done by Sisters of the Spirit who identified that there was a gender problem. The RCMP said that they were crazy, and the numbers were not right. Low and behold, they investigated, and they found out the numbers were right. It exacerbates legacies and is a problem for cultural security. We collectively have to own it. That is what has been missing today. Yet, we have great role models and leadership. It is not visible everywhere. Dwayne Menezes: How do we decide policies and strategies going forward? How should the policies be framed to address the SDGs? At what level should we be discussing the policy? Should it be in local communities and cities, regions, countries, the international level, or in a multinational form? What role do institutions play? Are existing institutions and mechanisms enough? Do we need new institutions within existing institutions to facilitate the implementation of the SDGs? Is there a way to evaluate it? Should we have mechanisms in existing forum? How can we move forward to implement policy? Heather Nicol: I am thinking about new approaches to understanding climate change and adaptation. That speaks to the issue of scale. I do not think there is one answer. Scale is what you make of it. Many geographers will tell you scale is a social construct and that it does not exist. We have to throw out the notion of efficiency in a traditional way. The SDGs talk about cost-benefit in a different way. We have to think about the issue of scale as commensurate with the definition of the problem. Who should be doing that? I do not think we have the answers yet. How do we measure that? We are not there yet. We have not done so well in institutions. They have gotten us into some of these problems. I do not think there is one answer. I am all for academia studying the problems. I am all for educational institutions. The institutions have been strengthened by the SDGs, which is a circular argument. Mikaa Mered: The institutions work well. The problem is, they are not focused on the right things. Let me give you one example, the Arctic Council Project Support Instrument. It could be a hedge fund for the Arctic. It could be a multi-billion dollar instrument. It could be an investment fund for the Arctic. It is not. Why not? It is because states and the people building the institution do not think about people. We need to be more innovative. If we are not innovative, we cannot take institutions that already work well to the level they could be at in the future. The scale of the problems in the Arctic is at a multi-billion-dollar level. We are talking about projects at the state level. The problem is, you need to channel that money to the local level. You need to channel decision-making power from the top to the grassroots. Veikko Kärnä: We need a regional innovation system for the Arctic. I think that we have all the institutions available. How are they working and functioning? I suppose that a lot of you have heard about the helix approach. There would be academia, industry, governments and the local people cooperating. Getting those four working together is the key, not new institutions. The scale depends on the country. In Finland, it would be on the level of the Lapland Region. It would be a new innovation system for the Finnish North. I do not know what that would look like in Russia or Greenland or anything like that. Jeremy Rayner: The record of the Millennium Development Goals, as well as many countries such as my own on climate change, has shown the difficulty in tackling problems on this scale that rely on policy instruments that are voluntary. We need to return to the idea that many of these problems cannot be solved without a regulatory approach or the building of significant organisational and financial capacity. That leads to the problem of scale. We need to re-think the locus of authority to make the decisions to deliver that capacity. There is a discussion in many countries about Indigenous peoples. There is a difference between reconciliation as a consensus-building mechanism in existing institutions, and reconciliation as recognising inherent rights to decide and regulate. Terzah Tippin Poe: The regulatory environment is critical. I will go back to my industry experience. Often, it is multinational corporations that are, because of their involvement in large-scale projects, developing policy. Policy is not being developed in the capital. It is being developed in boardrooms and project management rooms somewhere in the Arctic. These policies become the regulations about environment and social impacts. Nothing like a project gets things moving from a community or national standpoint. Corporations often pay attention to communities. They bypass states and governments. What is of concern to Shell or Exxon is communities. Out of the top 190 top extractive projects in the world, such as oil and gas extraction, 73% stopped or slowed due to non-technical risk, the majority of which is conflict with communities. That opposition costs companies $20 million a week. Communities have a huge leverage point. Industry is going to look at the community first. They will ask, “Can we do a project there and will they accept it?” A state or region almost always gives permits. It is the communities that stop projects. Aleqa Hammond: It is very important for all of us to recognise that the 17 Sustainable Development Goals are for the people, and not for industry. It is for all mankind to follow, regardless of whether you are in the North or South, or industry or private business. This counts for everybody. The SDGs ask us to change how we think. What we are doing today is not good enough. It is destroying us. It is asking us to change the way we do business. The next step should be to discuss with those that do not agree. We need ownership on the discussion on how to achieve these goals. If we do not have this discussion, the goals will fail. Due to climate change, the Arctic is a new hotspot. It is a hotspot for tourism, industry, politics and sea routes. All of these will have a big impact on our understanding of sustainable development in the Arctic. It will change the scale of how we govern in the future. Industry needs to discuss how we ought to go for it. The instruments today are already strong. Even non-Arctic countries are forming Arctic policies that are very instrumental for us to have an influence. Veikko Keränen: I think that after all of these discussions, I understand the overall views much better. This interaction is appreciated. All of these discussions result in some change in our way of thinking. It has an impact. I can see the complexity of these issues. Dwayne Menezes: I am going to outline how the project we are working on will move forward. First, we need to build consensus that the SDGs apply in the Arctic. Second, we need to get all of the countries to understand why they should commit to encouraging the re-articulation of the Arctic discourse. It needs to take into consideration all 17 SDG goals. The first thing that countries such as India think about when it comes to the Arctic is climate change and melting ice caps. They are not wrong, and this is important. But this is not the complete story. It is important that not only those of us who work in the Arctic, but also the world at large, realise that the Arctic has a critical human dimension. I think it is important to build an international movement around it so that when people around the world engage in the Arctic, they realise that there are people living there with a number of different issues that matter. That is the aim of the project. We plan a session or two each month both in the Arctic and outside the Arctic. We want to educate, inform and have a dialogue. We started last month with an inaugural event at the Arctic Circle Assembly in Reykjavik: the purpose of that session was to explore how all 17 SDGs relate to the Arctic and how they translate. The purpose of this session in Finland is to discuss where do we go from here. It is to understand the factors we need to continue. At Trent University, on 5 December 2017, we are organising another session to discuss one or two of the SDGs in depth. We are going to look at issues like telecommunication, housing, education, health and others. In January, we move to Norway to discuss how to bring this all together. How do we bring in the quantitative side? How do we map the issue? How do we visualise the data? How do we measure the SDGs? In February in London, we will look at climate, health and how they factor into Agenda 2030. Later in the year, at the UN Human Rights Council in Geneva, we will look at human rights issues and how they fit into the SDGs. We will look at gender and Indigenous rights. In April, we go across Europe to Rome, Copenhagen, Paris and other cities to communicate to local stakeholders how SDGs are the way forward when it comes to Arctic issues. We will also go to the US, with the same idea. We then move on to Asia. By September, we hope to go to the United Nations in New York to bring together all of these sessions we have had and all of these experts with overlapping interests. We will discuss the deliverables we can produce. The purpose of the first year is to build consensus and identify shared priorities. How do we measure SDGs? How do we understand how countries are performing? Are these measurements based on how countries perform when they cooperate? How should we focus on the SDGs? Is it most helpful to focus on them one at a time, or must we look at the intersections? What is the best way to take the dialogue forward? Veikko Keränen: Each one of the SDGs already has indicators. They may not be the correct indicators with respect to the Arctic. But we have a start with the indicators that have already been agreed upon by the United Nations. Terzah Tippin Poe: How do countries make these actionable? How do countries embed them? I will use an example of the UNDRIP, which is something I focus on extensively in my academic work. It was the declaration on 13 September 2007 by the UN member states that said Indigenous people have certain rights, along the lines of human rights with a special status. There is a pathway to the global community through Indigenous peoples, because they have been conferred with special rights by the body that came up with the Sustainable Development Goals. The only holdout is the United States at this point, unfortunately. Once we have a signatory, how do we make these goals actionable? The most controversial was prior informed consent. Multinational corporations were concerned. When you talk about consent, you go far beyond consultation. Did the Indigenous peoples say yes? That is probably why the United States cannot sign on. How has it become actionable? The lending agencies like the World Bank had codified the principles of prior and informed consent from the DRIP. If you are a country looking for funding to do a project and you go to the IFC, they are going to ask if you are following the UNDRIP guidelines. That is how they made the UNDRIP guidelines actionable. There is something there for countries to look at and ask whether we see these being embedded. Other banks have codified the UNDRIP into their lending in just 10 years. We see countries codifying amendments to their constitutions on prior and informed consent because otherwise they cannot get money from the IFC. This is a very clear path. I am not saying it is easy or simple. It is one model on how we do it. Dwayne Menezes: One thing we did in the Commonwealth was to create a joint delegation to the G20 summit where we said we tried to represent the 172 countries not at the table to raise their concerns. Having a similar form of engagement by the Arctic States at the World Bank and G20 could be quite interesting. The Arctic Council should not be an institution that just looks inward, but advocates for the Arctic States outside the Arctic. Mikaa Mered: What you want to achieve is impossible. When it comes to Arctic change, there will be many more losers than winners. Arctic peoples are going to win, hopefully. The rest of the world will be a loser. How can you argue that it is okay when Arctic people, who are only a tiny fraction of the world population, will win. That is difficult, but not impossible. Only Indigenous people can carry out that message. Heather Nicol: I think the role of the Arctic Council is important. There is the Sustainable Development Working Group, which had not been doing a lot on the human side of sustainability until fairly recently. In the last couple of years, it has turned its attention to issues with a social component. There was a World Economic Forum group working on an Arctic Investment Protocol that disbanded earlier this year. They turned it over to the Arctic Economic Council, which is supposed to deal with economic development outside of the framework of sustainability through the Arctic Council. How are these decoupled institutions going to work together? Mikaa Mered: The Arctic Economic Council was supposed to be just that. In the last couple of years, it has become a club. It is not the same purpose. It is to create a club that does economic stuff in the Arctic. If you are a club, it means you are working for your own interest. You are not working for something greater than the sum of the interests you represent. Aleqa Hammond: The Arctic Council has become akin to a club. But, thanks to the club, interest in the Arctic region is stronger today than it would have been otherwise. Thanks to the Arctic Council, our understanding of sustainable development in the Arctic is stronger than it otherwise would have been. Thanks to the Arctic Council, other countries have shown an interest in what it has done. The Arctic Council is going ahead and leading the other countries to see the principles they are using. Nobody is winning on this issue. Our culture is endangered. Many cultures we have in Greenland are endangered. It is very fast, without much chance for discussion. We have to act right now on all the principles if we are to come out as proud people, as we always have been. I would say that Greenland has already achieved some of the goals. When it comes to affordable and green energy, 75% of Greenland’s energy is hydro. We produce our own energy that is affordable. The rest of the world can gain from that because we produce more energy than we can use. Energy companies need to re-think how they run their business in the future. Maybe they can relocate to the Arctic where energy is clean and plentiful. If everyone is to win, we have to re-think where we want to be. Terzah Tippin Poe: Saying that the rest of the world loses by the Arctic implementing the Sustainable Development Goals predisposes that the policy will be bad for the economy. I would suggest the opposite. When you have healthy communities and strengthen the region, it is a better investment for industry. I will tell you that as somebody who evaluates new country interest. We look at the stability of the region. If you do well on these items in your region, industry will want to come and do business. They do not want to be held accountable for a bad environment. There is not a backroom wanting to go mess with the people. We want predictability, access and alignment of stakeholders. This presupposition that this is antithetical to economic development is not proven. The data that is accumulating says the opposite. Question from the audience: Where do the goals come from? Is it based on research or ideas? What will be the priority? What is the problem at the moment? What is the most urgent goal? Each version has different ideas. Mikaa Mered: Aleqa, maybe you misunderstood me. What I meant by the notion that we are going to win and you are going to lose is: In Greenland, if you lose your culture as you know it, you can still adapt. In Bangladesh, people will just lose their land and they will have to go somewhere else if they go to the sea. That is what I was talking about. In answer to the question, yes, you do not have the power to decide. But, you have the power to get yourself heard by those who decide. To do that, you have to be very innovative. If you want people to listen, your ideas have to be something people have not heard before. Even if you are not heard, at least the idea will be there. People with more power and influence can take up the idea. Heather Nicol: As I understand, there were a number of Millennium Development Goals. The idea was eradicate poverty. It was felt that they were not particularly effective. The SDGs are a re-think to understand the complex webs and interdependencies. So, that is where they come from. The idea is that we are talking about having a dialogue and discussion. Question from the audience: Which is the most urgent and important goal? When I go home, I might not be able to focus on all of them. Veikko Keränen: We need investments. I think that without economic activity, we do not have a future. Aleqa Hammond: Students have a very strong voice in this. I think that is how we should see it. It is not top-down. It is bottom-up. The genius of these goals is that they are different. These goals require inter-ministerial cooperation to implement. Before, it would be the environmental ministers. Today, it is education, fisheries, industries and health. Everyone is interconnected. It is thanks to the researchers. Question from the audience: How much emphasis is given to SDG 14? In New Zealand, we are concerned with the work, effort and youth involvement on number14? Comment from the audience: People could go to SDGaccord.org as a yardstick to measure what is happening every year. Comment from the audience: A lot has been said here. There are two words that came out, one directly and one indirectly. One is resilience. The other is adaptability. The goal is not the target of 2030. It is not about development. It is about sustainability and achieving that. Right now, there are not many of us living a lifestyle in a community or region that is sustainable. I was in China recently, and one of the students mentioned in the seminars a quote from Confucius: “If you plant rice, you plan for a year. If you plant a tree, you plan for one’s life. If you educate a child, you plan for generations.” It is not 2030 that is the goal. We have to go to education. Whatever we achieve by 2030 has to be taught. There is no static or ultimate point. It is about adaptability. There are disturbance factors that can impact any goal and put us back 2 or 3 centuries. We can lose all of these steps forward in a blink of an eye. Whether it is the sun, or migration, those things can impact any efforts. It is fluid. We need to think about fluidity as we move forward to the ultimate goal. I will say a few words to comment on some of the discussion. I don’t believe in any kind of inevitabilities or multinationals invading the regulatory environment. I don’t believe in having a universal plan to erect the regulatory environment we used to have. I don’t think animal welfare organisations will rule everywhere. We have this notion that there are driving forces. I don’t believe in that. The world is too complex. When it comes to the oceans, there is a lot happening. There are treaties in the high seas. There is the process to protect biodiversity in areas beyond national jurisdiction. We know most of our planet is ocean. Let me give my own perspective. I am familiar with sustainable development work from the Rio conference onward. We normally think the SDGs are related to the Millennium Development Goals. They are much larger. They go back to the Bruntland Report, along with the 1992 Rio Conference and Johannesburg Summit on Sustainable Development. There is Rio 2012. All of this sustainable development work is ongoing. Yet, the Arctic Council has not tapped into this work. The Finnish government initiated the Arctic 8 process, and it began in 1996. A pillar was sustainable development. It was not linked to UN sustainable development work. Finland, in its first chairmanship, tried to do that. Now, the time is right for doing that. The link to the Millennium Goals is the fact that these are goal-based topics. That is why we associate the SDGS and the Millennium Development Goals. They were made for the global south. The SDGs are for all of us. They were intensely negotiated and adopted at a high level. All of the countries of the world have adopted these at a high level. At the high level, we have adopted a huge number of indicators, and how to measure the progress. The missing link is science, knowledge and statistics. Even in the Nordic states, we have covered 40% of the data needed to measure the success of the goals. Of all those, we don’t know a lot. Around the world, we are missing a huge amount of information. In my own small world, Finland is chair of the Arctic Council. I am leading an expert group. We are trying to come up with research agendas to create sustainable development reports to sustain the Sustainable Development Working Group and other working groups. Members of are nominated by countries and permanent participants. Ideally, we will pull together a group of researchers to understand a variety of issues. In that sense, I am suggesting that we have to start quite quickly to move from the science and try to come up with new indicators and move to action. Otherwise, all of these country reports in high-level forums do not reflect the Arctic specific issues. That is the danger of national policies. They are missing the whole picture.